Sciblogs | Why sequence the tuatara genome? Sequencing and making sense of the tuatara genome is going to be a big project. It will take the skill and dedication of many scientists, help from our partner organisations and probably several hundred thousand dollars on top of that. We can only put so much time and effort into this project because we know a tuatara genome sequence will provide a unique insight into how evolution works, and serve as a valuable resource to other scientists. So, why are we so confident that the tuatara genome is going to repay our investment? Evolutionary relationships among reptiles. See footnote for attributions for these figures. You sometimes hear people mistakenly call tuatara “living dinosaurs”. In fact, as you can see in the figure above, tuatara are much more interesting than that. If you want to study a living dinosaur you only need to look out the nearest window. Modern birds descend from one branch in the diverse group we call dinosaurs, but each of those ten thousand species are dinosaurs. The tuatara, on the other hand, are the only living members of a lineage that separated from other reptiles more than 200 million years ago. By placing modern organisms in the context of their evolutionary history, we can work out which traits were present in ancestral species, and reconstruct the changes that gave rise to modern ones. As the tuatara is the only living witness to hundreds of millions of years of evolution, its genome sequence will be immensely valuable in understanding the genetic changes that have allowed reptiles to evolve and diversify. In fact, even the tiny amount that we already know about tuatara genetics has helped us understand not just the evolution of reptiles, but how mammals (like us) have evolved. Given the unique position the tuatara has in the history of life, it was always going to be a target for a genome sequencing project. Indeed, when our partners the Genome10k Project drew up a list of the most important genomes to sequence they put tuatara at the top. Doing the genome project in New Zealand also means we can focus on the tuatara themselves, and not just their importance in understanding evolution more generally. The tuatara is an endangered species, and learning more about its biology may help us protect it. Populations with lots of genetic diversity are better able to overcome threats, such as climate change and disease, which may put species at greater risk in the future. By producing a single reference genome we will make it much easier to get genetic data from tuatara populations, and help the Department of Conservation and Ngātiwai manage the species in way that increases its chances of survival. As well as providing us with new knowledge, the tuatara genome project will help New Zealand scientists develop the skills required to deal with the massive amounts of data created in genome projects. The capacity to undertake such initatives has been recently developed in New Zealand through the establishmnet of New Zealand Genomics Limited, a collaborative infrastructure that provides genomics technology and bioinformatics services to underpin research in a broad range of areas, including medicine, agriculture and the environment. Much of the work will be carried out by PhD students and postdoctoral researchers (recent PhD graduates), many part of the Allan Wilson Centre for Molecular Ecology and Evolution who support the tuatara genome project as part of their strategic initiatives. Over the course of the project, the skills and knowledge they and others develop will help to build the skills and infrastructure required to tackle future genome projects in New Zealand, whether they be focused on species of economic, ecological or evolutionary importance. Why blog about sequencing the tuatara genome? For all the reasons described above, we are excited to be working on the tuatara genome project. We hope this blog will help share our enthusiasm, and give readers an insight into how a genome sequence is produced. 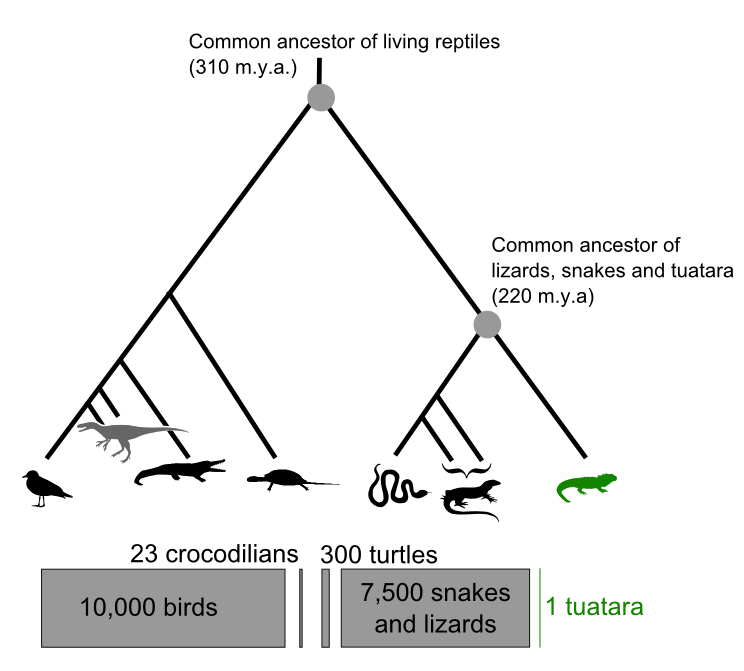 The Tree diagram from this post is derrived form “Tuatara Cladogram“, by wikipedia user Benchill. Two extra lineages are illustrated thanks to PhyloPic The (non-avian) dinosaur is Dryptosaurus aquilunguis as illustrated by contributor Conty, and the turtle is from Scott Hartman. Our figure is released under a CC BY-NC-SA 3.0 license. delighted but not surprised to learn that the chatty NZers have a Department of Conversation- but how do they get any work done? I’m not sure if my earlier posting to you made it through the ether….so here I go again. Could you comment on the current understanding of the Brothers Is Tuatara? Is it a separate species? How long has the Brothers Is tuatara been isolated from other nearby populations? Well, this comment made it through at least, not sure about your earlier one. We’ll certainly look at the “species question” (and the possibility of another sub-fossil species of tuatara) in the near future. IT MUST BE DONE IN ORDER TO BRING FORTH THE NEW AGE!